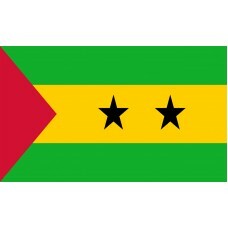 The Sao Tome and Principe flag consists of three horizontal bands in the colors of green, yellow, and green. In the middle of the yellow band, there are two black stars. On the left of the Sao Tome and Principe flag is a red triangle pointing towards the middle. 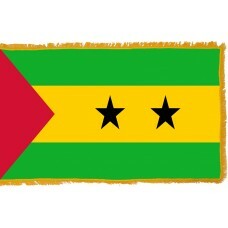 The green color represents the vegetation of the island, the yellow color represents the sun and cocoa, which is Sao Tome and Principe's most important crop. 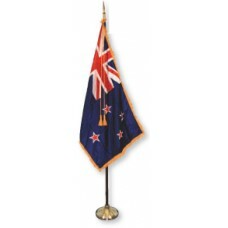 The two stars represent the two islands that make up the country. The Sao Tome and Principe flag was adopted in 1975 after the country gained independence from Portugal and replaced the flag of Portugal. 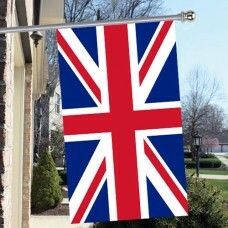 The flag is almost the same design as the flag that was used by the "Movement for the Liberation of Sao Tome and Principe." Sao Tome and Principe is an island country located in the Gulf of Guinea in Africa. It is the second smallest country in Africa. Sao Tome is the largest as well as the capital city. Sao Tome was named after Saint Thomas by the Portuguese explorers, as they arrived on the island on Saint Feast Day, and Principe was originally name Santo Antao (Saint Anthony) but its name was changed in 1502 to "Ilha do Principe" which translates as "Prince's Island" and was named after the Prince of Portugal. The island was discovered in 1470 by two Portuguese explorers called, Joao de Santarem and Pero Escobar. The island was uninhabited prior to its discovery. Following its discovery, the Portuguese began to use it as a base for mainland trading and eventually made settlements (mainly sugar plantations) and colonized it during the 16th century, from 1522. Many plantations had been built by the Portuguese and slaves were brought from Africa to work on the sugar plantations. From 1515, Sao Tome and Principe had become the base for slaves, which resulted in it being Africa's biggest sugar exporter. At the beginning of the 19th century, two new crops had been introduced – coffee and cocoa and by 1908, Sao Tome and Principe became the world's largest cocoa producer and exporter and still remains a major exporter today. By 1876, slavery had been abolished in Sao Tome and Principe by the Portuguese, however, forced labor continued. Forced labor continued for a numerous amount of years, until the native Creoles, who are also known as "Forros" began revolting and rioting against this. This led to the blood bath that is known as the "Batepa Massacre," and still remains a very important event in history for the natives and is a day that is remembered and respected by the country every year. The Batepa Massacre began on February 3rd, 1953 and hundreds of African laborers were killed by the Portuguese. Following the Batepa Massacre, towards the end of the 1950s, a few Sao Tomeans formed the ‘Movement for the Liberation of Sao Tome and Principe (MLSTP) to try and gain independence. As a result of the breakdown of the Portuguese Caetano dictatorship in April 1994, Sao Tome and Principe managed to finally gain independence on July 12th, 1975. To the sovereign country of Sao Tome and Principe.